It all started with a story. George Grimes heard a tale told by the local Indians of so much gold laying about that you could pick it up by the handfuls, and was inspired to check it out. He and a group of prospectors from Walla Walla, Washington set out for what would later be known as the Boise Basin in 1862, where he discovered the story to be pretty close to the truth. Unfortunately for Grimes, he was killed within just a few days of his find. Some say he was killed by a greedy partner, but the accepted story is that he was killed by Indians. Either way, he never witnessed the result of the Boise Basin strike his discovery started. Until gold was discovered in the Boise Basin, the area was a wilderness inhabited only by the Indians, with a few mountain men passing through. Within eight months of the strike, the area became the largest settled area of the Pacific Northwest. By 1863 the population of the area has been estimated between 25,000 and 70,000 people, with Idaho City alone boasting a population of 6,200, surpassing even Portland in size. Boom towns jumped up everywhere with the four major ones being Idaho City (originally known as Bannock City), Placerville, Centerville, and Pioneerville (originally known as Dugem). All four communities still exist on a much smaller scale today. As more and more people poured into the valley, and claims were staked, those coming later had to spread further out in order to find any ground worth mining. One group of miners ventured over a ridge onto Elk Creek, where they found a rich deposit. In an effort to keep other prospectors away, they came back into town with a story of being chased by giant bears. Today at the end of Main Street in Idaho City there is a gulch that is still called Bear Run. The actual rush years were considered to be 1862-1864, and turned out to be one of the richest strike in America. 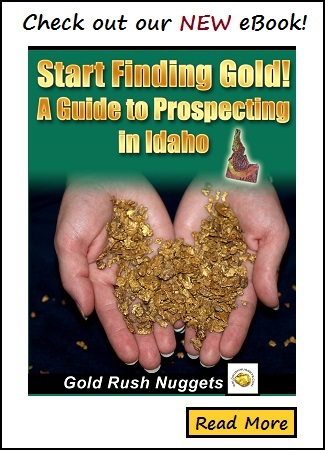 For a hard working gold miner in a good location, a week of prospecting could yield $2000 per week, and anywhere from $8 to $20 a day was not uncommon. The work was hard – bench gravels often had to be packed in backpacks and transported to the water, but a hardworking miner could use rockers to gain $50 to $60 per day. Sluices could be used while the water was high, but water often ran out mid way through the summer season. The actual amount of gold and silver taken from Boise County from 1862 to 1914 is in dispute, but the best estimate by the Geological Survey is $53,096,995, with more than 95% coming from the Boise Basin. Much gold from the area went into the Union treasury during the Civil War, helping to shore up the war effort. A very dry winter in California in 1864 pushed thousands of prospectors to look for better areas, and Boise Basin was the place they headed. Hundreds arrived weekly, and knowing that water would be in short supply that season, owing to a dryer than average winter, the work went on night and day without ceasing. Mining in the Boise Basin was profitable for an unusually long stretch. By 1870, most of the easy stream gravels were considered played out, and many claims were sold to Chinese miners, who were willing to work the lower grade claims which continued to be profitable for them. In the 1870s numerous stamp mills were in operation, and quartz mining prospered, supporting the area for decades. Placer mining continued for a long stretch because it was not possible to work an area long enough in a season to deplete it quickly. Dredge mining began in 1898 and continued through the 1950s. Much of the lowland of the Boise Basin is scarred from dredging, and the huge tailing piles are still visible today. Although Placerville was a more convenient location, Idaho City enjoyed greater growth and prosperity because of its more abundant water supply was available for a longer period during the spring, and it quickly grew into more than just a mining camp. By 1863 it had 250 places of business, 2 schools, a library, a newspaper, and five community theaters, and families looking for a place to put down roots and prosper were coming to Idaho City in droves. The ready availability of timber made it possible to build permanent structures quickly, turning tent towns quickly into permanent communities. Interestingly, Idaho City was where “vigilante justice” originated, at the instigation of the Rev. Charles Kingsley. There was certainly a rough-and-tumble aspect to Idaho City for many years, and bar fights and murders were prevalent in those early days. Today, with the price of gold sky-high, a second look is being taken at the quartz deposits in the Boise Basin. There is still a lot of gold in them thar hills, and while most placer deposits were eventually depleted to a point that they were not economically viable, lode mining has become a large part of the Boise Basin. With record gold prices in recent years, many of the old mines are active once more and the area is still producing gold to this day.